From the book The Bengali Five-Spice Chronicles by Rinku Bhattacharya comes this authentic vegetarian Indian food recipe for orange or red split lentils with tomatoes and fresh cilantro, a Bengali Indian recipe called Tomato Dhoney Pata Diye Masoor Dal. Author Rink says: "This is a weeknight variation of orange split lentils which are extremely versatile because of their quick cooking time and naturally mild and adaptive taste. They are comforting, simple, and as basic as it gets. Everyone in my family, including my children, loves this lentil. This light variation is a summertime favorite but can be enjoyed as a soup in winter, if desired, with some hot buttered whole wheat toast." 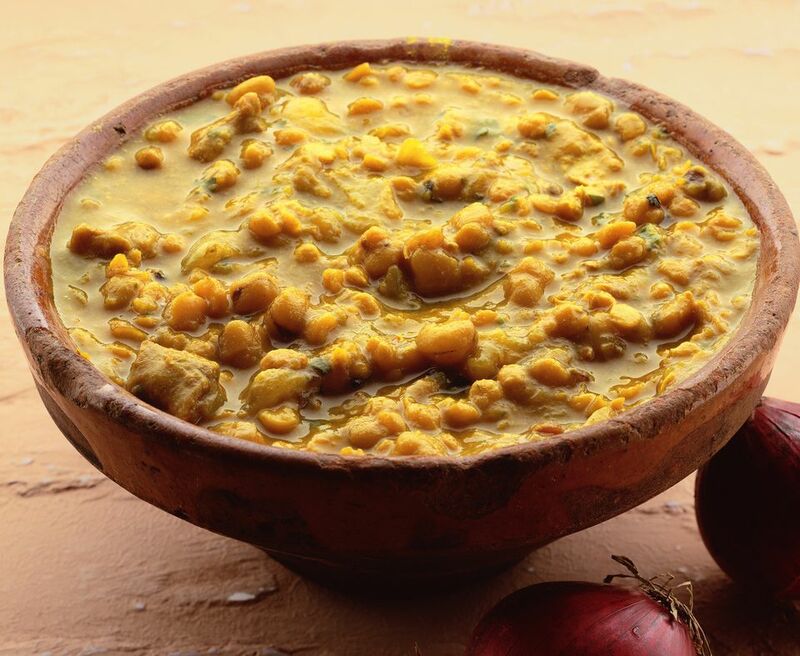 If you need to keep this Bengali masoor dal lentil dish vegan and dairy-free, you can use a bit of olive oil or vegan margarine in place of the ghee. Enjoy! Put the lentils and 3 cups of water in a saucepan and bring to a boil. Add the turmeric, salt, and green chilies and cook for about 15 minutes. While the lentils are boiling a scum may form on the surface; you can gently remove this while the lentils are cooking. Add the tomatoes and cook for another 5 minutes. Mix the lentil and tomato mixture well - it should have a nice soupy consistency that is not too thin or too thick. Heat the ghee in a small skillet on medium heat for about one minute, then add the cumin seeds and wait till the seeds begin to sizzle. Pour this seasoned ghee with the cumin seeds over the lentils and stir in the fresh chopped cilantro. Serve your red lentil masoor dal with steamed white rice, as is traditional in Indian cuisine, or, as the author suggests, as a soup with some hot buttered toast for a light meal. If you need to make this recipe dairy-free and vegan, you can of course substitute olive oil or vegetable oil for the Indian ghee. Enjoy your vegetarian masoor dal! This vegetarian masoor dal recipe comes from The Bengali Five-Spice Chronicles by Rinku Bhattacharya. Serve this red lentil Bengali masoor dhal dish with Indian basmati rice or Indian lemon rice, and of course, scoop it all up with some homemade vegan naan bread.